Belinda Hallows is an outstanding female singer and entertainer in her own right, but when performing as Adele, she is simple phenomenal! Performing hits to suit a vast audience in any venue, Belinda's ability to read a crowd is brilliant. Belinda, like Adele, can command and take the stage by storm and given such ability, talent and sound, her tribute to Adele is unique. 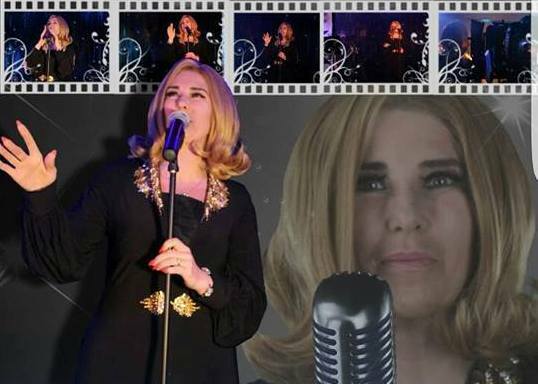 Belinda’s uncanny resemblance, facial expressions and quality singing voice guarantees an Adele Tribute Night of the highest quality which leaves audiences in awe! Belinda’s Adele tribute has travelled the all over the UK performing for private parties, corporate events and wedding functions. Belinda's tribute can be booked as a 60 mins show, or also with an extra northern soul n motown spot, or a mixed spot, as required. Belinda is also available as herself, performing 3 x 30 min spots with costume changes. She is fully self contained & also a member of equity with public liability insurance included.